Are you happy to see The Great British Bake Off back on the screens? I was pleased to see it back, and once again this year I’m going to be joining in with the Great Bloggers Bake Off when I can. This week on GBBO was Cake Week and the bakers made their Signature drizzle cakes, Jaffa cakes for the Technical and then genoise sponge mirror glaze cakes for the Showstopper. As I made a lemon drizzle layer cake and mirror glaze chocolate tart last time, that left Jaffa cakes. 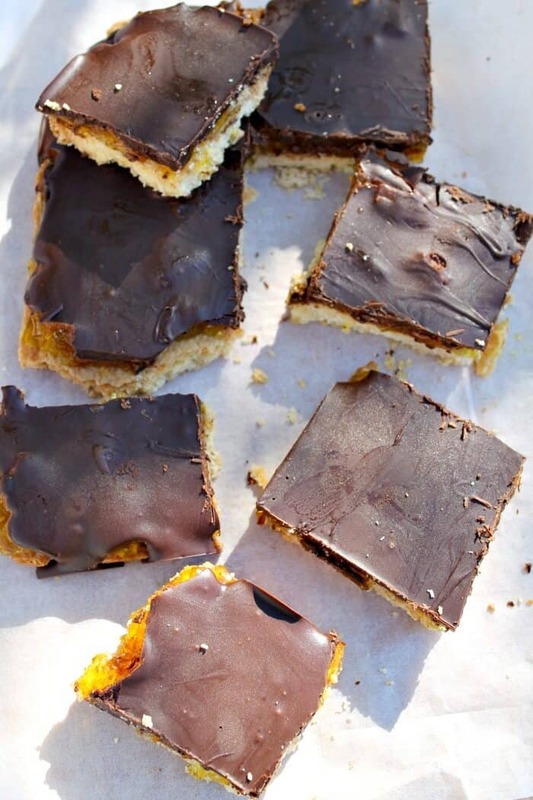 I decided to make my own spin on Jaffa cakes and ended up making a Jaffa shortbread slice, a kind of mixture between a Jaffa cake and a chocolate caramel shortbread! So not even a cake at all for Cake Week haha! Oh well, plenty more weeks left for cake still. 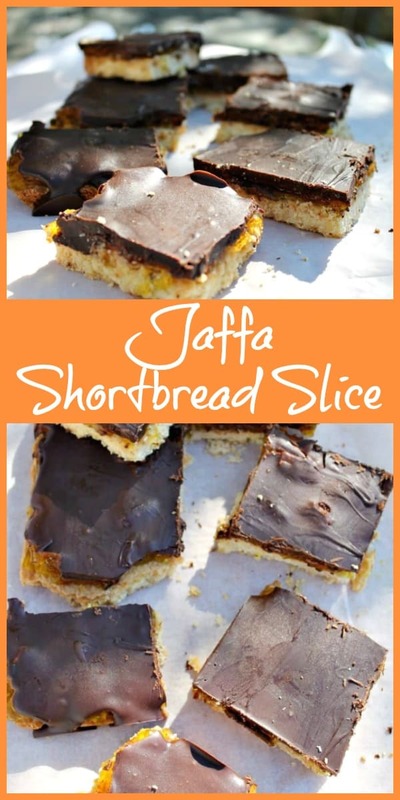 My Jaffa shortbread slice is made up of a delicious layer of crumbly, buttery shortbread, topped with a layer of orange jelly, and then a thick layer of plain chocolate. 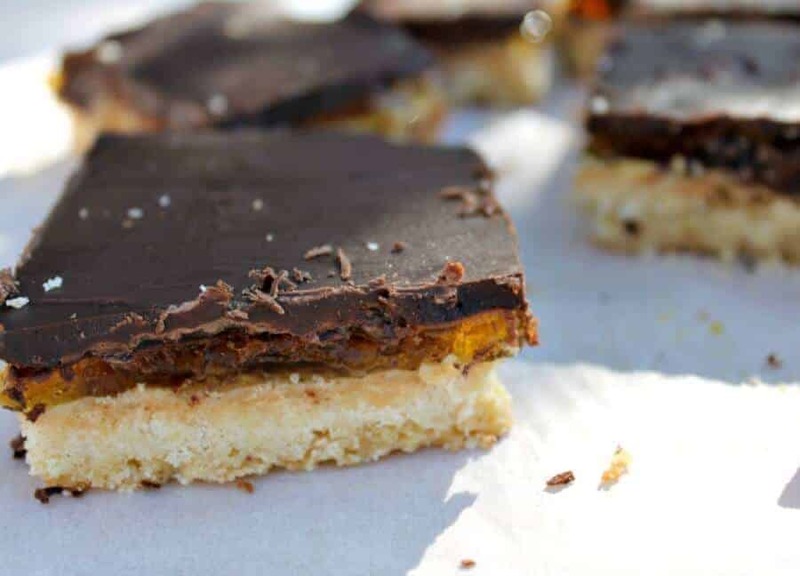 Part Jaffa cake and part millionaire’s shortbread, with jelly instead of caramel, it is pretty easy to make and went down a treat with my family. I can’t blame them really, I may have nabbed a couple of slices that broke apart already…. 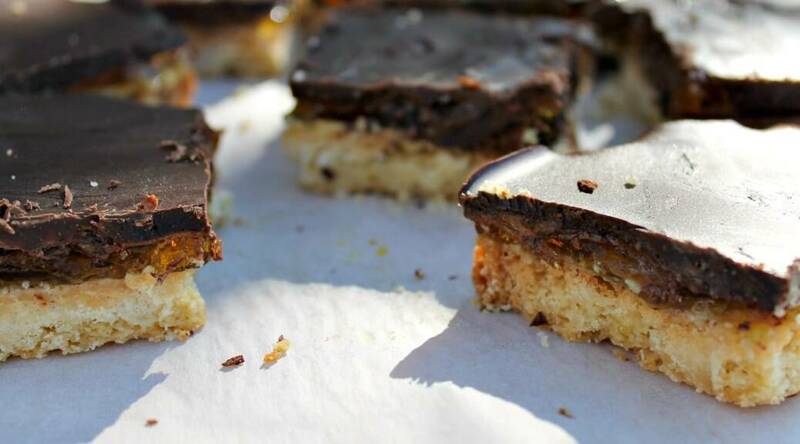 Chocolatey goodness set off by the tart jelly and crumbly shortbread – so delicious! Its a lovely weekend bake to make to enjoy with friends and family. The rustic look is fine with this bake! There are a few steps in this recipe, due to the layers you need to make. First make up the jelly in a square baking pan. I added extra gelatine to the orange jelly pack to make sure the jelly was thick so it would stand up to being sliced. Next bake your shortbread layer, again in a square baking pan. Once it has cooled, place the jelly on top of the shortbread. This is quite tricky, be gentle and remember it will be covered chocolate so you won’t be able to see any breaks! Finally, melt chocolate then pour it over the jelly and shortbread, still in the tin. Put in the fridge to set. Cut into squares with a sharp knife once completely set. 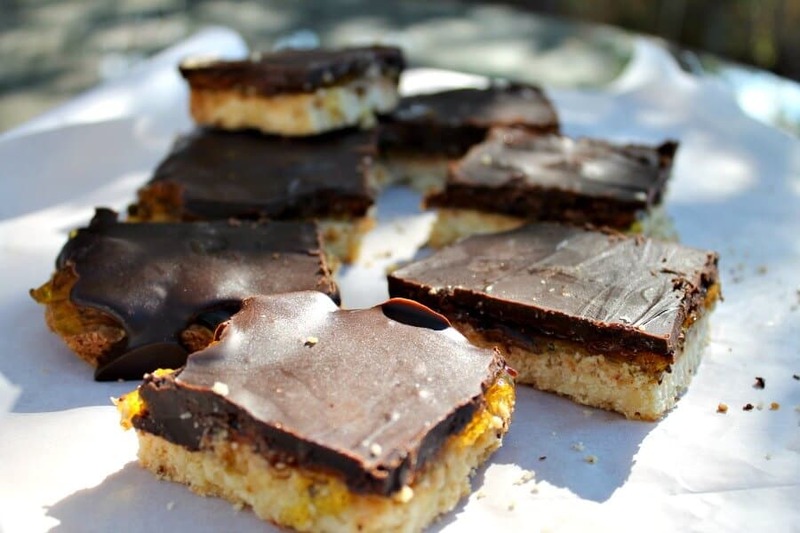 A hybrid of jaffa cakes with their orange jelly layer and a millionaires slice! First make the orange jelly to give it time to set. You might want to do this the day before. Make the jelly up as directed with boiling and cold water in a jug. To give a better set, I added additional gelatine. Soften 1 leaf of leaf gelatine in cold water, squeeze it out, then melt the leaf by heating on a low heat in small bursts in the microwave. Stir vigorously and add to the jelly in the jug. Mix well then pour the jelly into a shallow baking tray lined with clingfilm to set in the fridge. Leave for a few hours until set. To make the shortbread layer, leave the butter out until softened or warm up gently in the microwave. Then combine the caster sugar into the butter until soft and fluffy. Add the flour and mix well. Press into a ball with your hands. Line a square pan (I used a silicone one, approx 9 inch squarwith baking paper. Press the mixture into the pan with the back of your hand. Bake for 25-30 minutes until golden brown. Leave it to cool completely. When cool, cut your jelly to size and place it on top of the shortbread layer. This is quite tricky to do and mine broke in places. As the jelly layer will be covered in chocolate it doesn't really matter, just try to move it gently. Break the plain chocolate into pieces and microwave in 30 second bursts on high, stirring in between, until fully melted. Allow it to cool a little then pour it on top of the jelly, spread it with the back of a spoon then put it back in the fridge to set. Use a hot knife to slice into pieces and serve. That looks delicious – I’m going to have to try it! 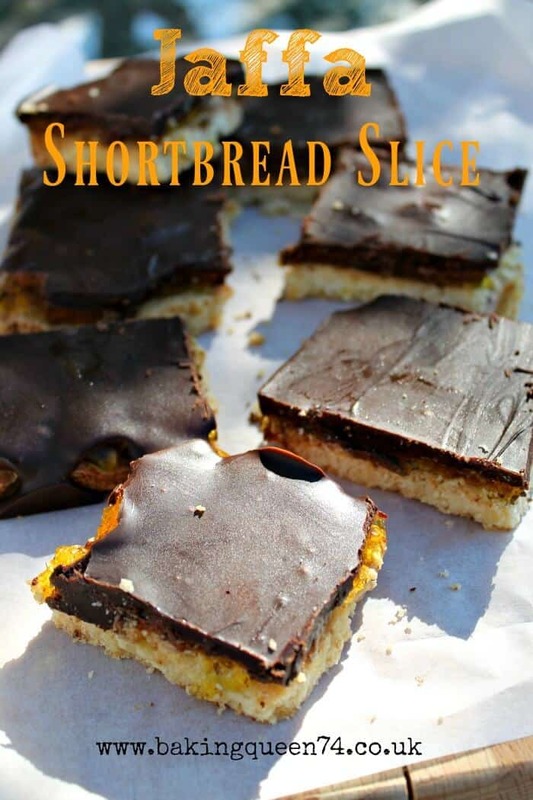 Oh what a brilliant idea to use a shortbread base, I’d try this out myself. These look utterly gorgeous! Shortbread is so good and I bet it’s lovely combined with the chocolate orange flavour of a Jaffa cake. Mmmm yummy not sure I’d be able to choose between my sponge and your shortcake version these look really tasty! One of each would be perfect!! Ooo I’m loving the twist – they look delish! oh my oh my… shortbread is one of my favourite things in the world **hello biscuit week** and these.. Oh Lucy! YUM! You’re right Jenny they aren’t a cake at all, hee hee! Brilliant idea with a cuppa. If there are any left tomorrow I might nab one and do just that. I do like the sound of this.and you avoid the problem of the chocolate slipping off the jelly that other bloggers have had with the small Jaffa cakes. Win win! Thanks Jacqui! The jelly was slipping all around but not like on the round Jaffa cakes I guess. Thanks Tracy,not tricky at all! Two of my favourite things to eat are jaffa cakes and shortbread. I never thought to merge them but I will be doing now! Thanks a lot, a tasty combination!